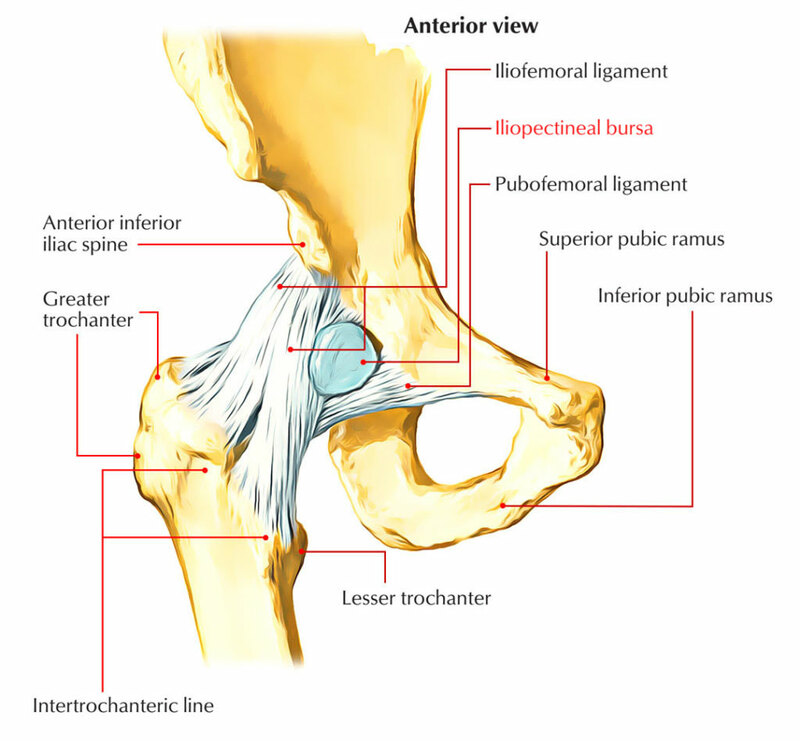 The iliopectineal bursa is located among the anterior area of the hip joint along with the iliopsoas muscle. It is the biggest bursa in the body, also in 15% of adults, interaction among the bursa as well as the hip joint is found. It is located among the inguinal ligament along with the iliopsoas muscle just lateral towards the femoral artery. The iliopectineal (iliopsoas) bursa enables the iliopsoas muscle/tendon to shift freely over the hip joint when it flexes the thigh. Due to excessive fluid, the normally collapsed bursa shows up. The iliopsoas tendon common tendon of iliacus and psoas major muscles attaches over the lesser trochanter. The iliopectineal (iliopsoas) bursa enables the iliopsoas muscle/tendon to shift freely over the hip joint when it flexes the thigh. Due to excessive fluid, the normally collapsed bursa shows up. Being seated with the hip in flexion for a long period of time may cause provoking of symptoms. Pain along with possibly inflammation within the groin anteriorly is fairly common. One of the most typical triggering sources is intense periods of running, training, especially in hurdlers. It might get swollen from running or other similar damage. Pain in the anterior pelvis, groin, as well as thigh is the most frequent symptom of iliopectineal bursitis and inflammation under the inguinal ligament may lead to a protrusion bearing resemblance to a femoral hernia. Bursitis may exist together with intrinsic inflammatory joint disease like rheumatoid arthritis. Expansion of the hip (e.g. during walking) magnifies the pain, so the patient often restricts the step of the impacted side. Weakness of anterior muscles of the thigh additionally may occur. Whenever a bursa is enlarged, it may compact the femoral vein, causing edema within the concerned leg. The anterior crural nerve (the largest division of the lumbar plexus) is located just under the bursa and also get agitated from bursal swelling. The emerging neuritis induces pain within the thigh, which typically is also sharpened by walking. Passive flexion along with turning of the hip causes pain, but activation of the iliopsoas in extension opposed to resistance is painless. If iliopsoas bursitis is presumed, ultrasound examination or MRI examinations will show the enlarged and may be fluid – filled bursa.